Okay, folks, I'm going to chalk it up to poor sleep lately. But I'll admit, when I was covering the new Asus Zenfones I didn't even notice that there were notches. How could I miss that? Apparently, it's suddenly a trend for Android phones to sport the notch. And everybody's blowing up about it (okay, that's just one 'iVerge' article, but there are plenty of others out there decrying it). Sure, there's the Zenfone 5/5Z, there also was this prototype of an LG G7 that was shown behind doors (so you know that's official.../sarc) and apparently this super popular Ulefone. Sure apparently it's rumoured that the Huawei flagship might, and the OnePlus will too... but it's a wait and see. So not 'everybody', but more than a couple are sporting the iPhone X notch. But hey wait a minute, ... didn't the Essential come out first? The PH-1 had the 'divot' first! Okay, I'm not going to get into a 'who did it first' or "who's copying who" fight here, but I hate how it's immediately seen as 'everybody's copying Apple' over just one small thing. Anyways, I'm of 2 minds about the notch. First off, I hate it. Well, I hate the 'idea' of it. But more of that later. It moves your notifications up to the nether regions of your phone so that a) it's harder to reach to bring down the shade, but b) limits how many notification icons you can see. Now, I'm a notification 'purist', kind of like an inbox-zero kind of person. I need to get rid of icons. That should be clean up there. Even still, there are still some apps that won't sort together, and I'll get 4 notifications for BoomBeach and 2 for Facebook and and and... even on a QuadHD screen that bar fills up quickly. Cut down that screen area and soon you'll get the "..." up there and that means some important notifications can hide away without your notice. Now, again, *I* have a smartwatch, and I'm vigilant about seeing my notifications. Not so proficient users ignore them so easily (god, especially the recent iUser converts I've made... nobody uses the notifications in iPhones, they're so terrible) that whenever I look at someone else's phone, my eye twitches just seeing how many notifications are up there. Surely this is just a cosmetic thing. Which leads me to my 2nd point. Secondly ... we get over it pretty quickly. 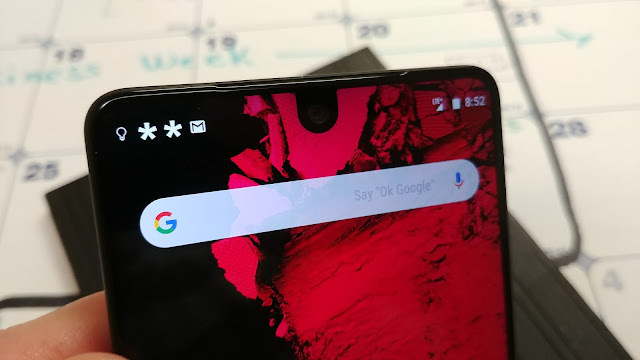 When I reviewed the Essential I thought I'd start to hate that bit. But I was over it so quickly that I didn't even mention it in the review because it was so... invisible after only a short while. So, if it's something we can ignore quickly, the benefit is that we'll get more screen real estate. Cool. Thirdly, if everybody's copying the iPhone X, why would they want to do that, when they talk about iPhone X is that the sales aren't that great (then again, depends on where you look, but a quick googling of 'iPhone X sales' reveals way more 'poor' than 'soaring' options). So why emulate a phone that isn't selling well. Methinks that it isn't selling well for reasons other than the notch. Again, it comes back to being able to squish more display into the same size body. getting 18(+):9 ratio gets us part of the way there, but what more can we fit? What do you think of 'the notch'?